This month has been an unusual one, as far as most Decembers go. I had knee replacement surgery on December 9 and came home after spending 14 days in rehab unit. The therapy is a bear, but I knew this from my other knee and I'm thankful for a skilled and dedicated therapist. 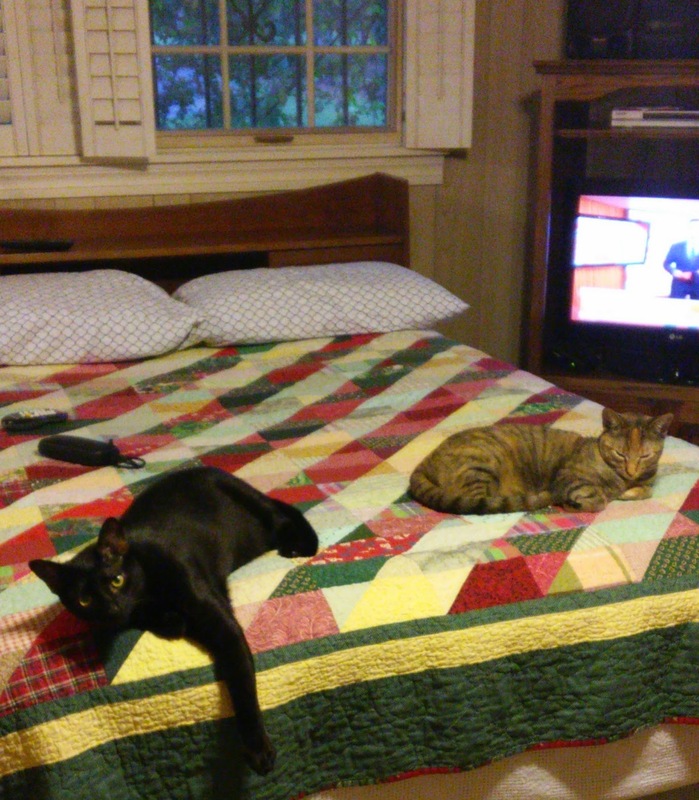 While I was away friends and my daughter took care of my kitties; it is so good to be back with them, but I don't feel well enough for quilting or art activities. There's no telling what interesting blog reading I'm missing during this down time, so I'm hoping to do some catching up soon when my brain is rid of the anesthesia and pain meds. The joy of Christmas this year came in my participation in the Advent banners, singing with our church choir and hearing beautiful music on CDs. Our celebrating does not have to be the same each year as long as we remember the birth of the Christ Child. 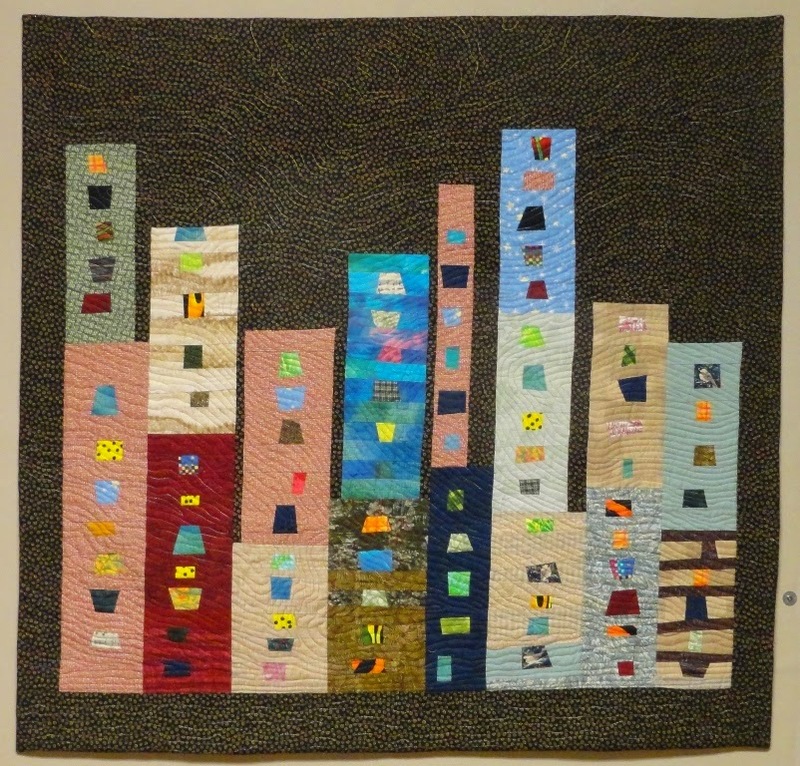 There are interesting and challenging art quilts to make; it is neat to reflect on milestones like my guild's 30th anniversary and to think of the marvelous friendships that have come from it and Mississippi Quilt Association. I look forward to a creative and joyful 2015! It was my pleasure to head up a committee to make new Advent Banners for my church, University Baptist in Hattiesburg, MS. 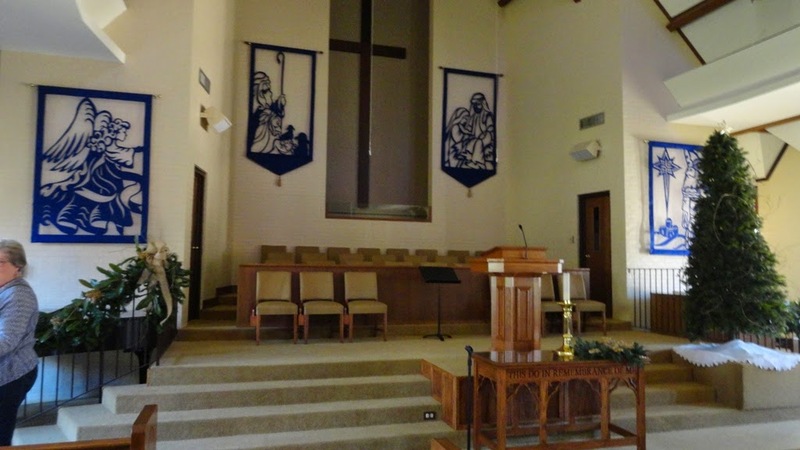 The four banners were hung for the first Sunday of Advent, November 30, and were warmly received by the congregation. Many people wanted to know how these came about, so here is their story. Our pastor, Rusty Edwards, brought a book home from a conference he attended last summer. 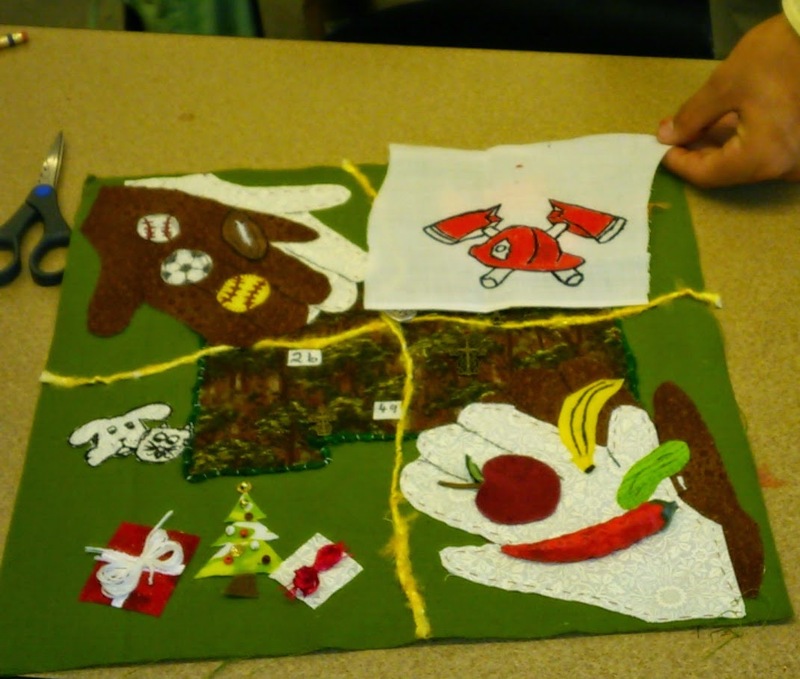 The book, A Cut Above, by Sarah Brogdon, featured cut-away felt banners in many designs. I had never made anything like this but thought the project looked possible and agreed to lead it. 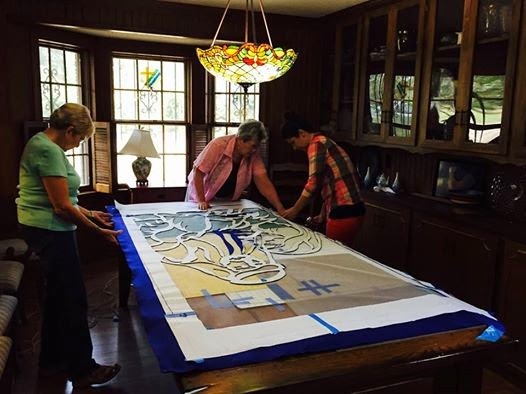 We ordered four patterns, royal blue felt, and netting and I enlisted several people to help in the construction. Since the only sewing involved was one line of stitching at the top and bottom to create rod pockets, anyone who could cut accurately with scissors and/or a rotary cutter could help. 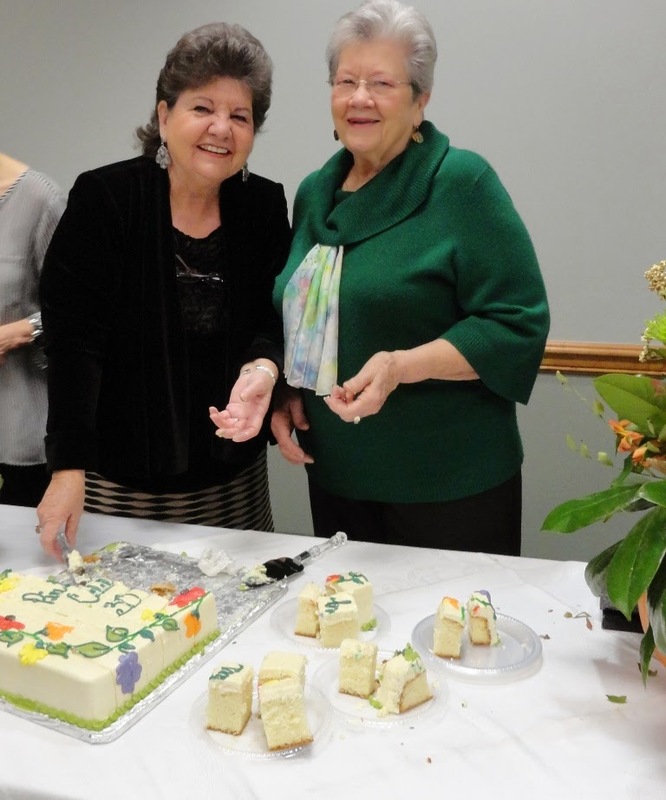 Workers were Kat Spangler, Joy Dunbar, Connie Benedict, Nancy Ratliff, Ellen Hall, Rosanne Crockett, and Rusty Edwards. Yes, Rusty used a rotary cutter as well as a glue gun. 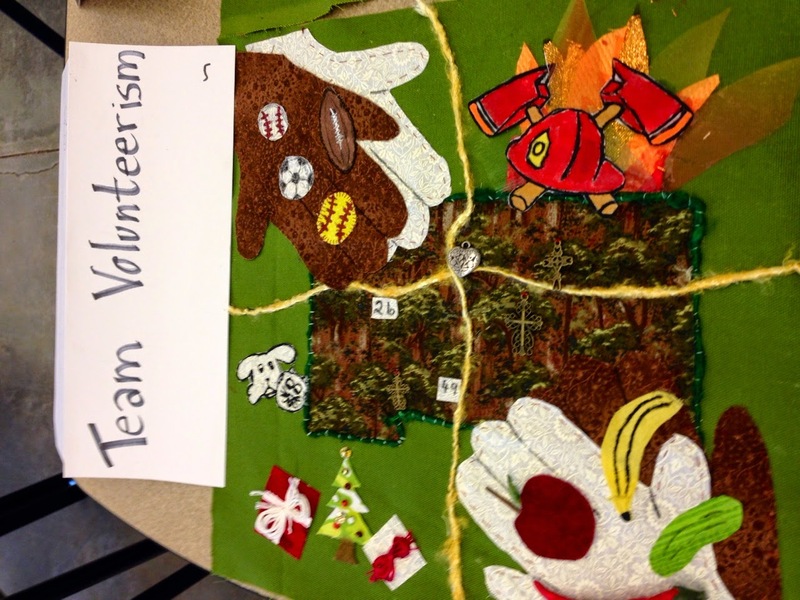 This was definitely a team effort and if work can be enjoyed, this certainly was. 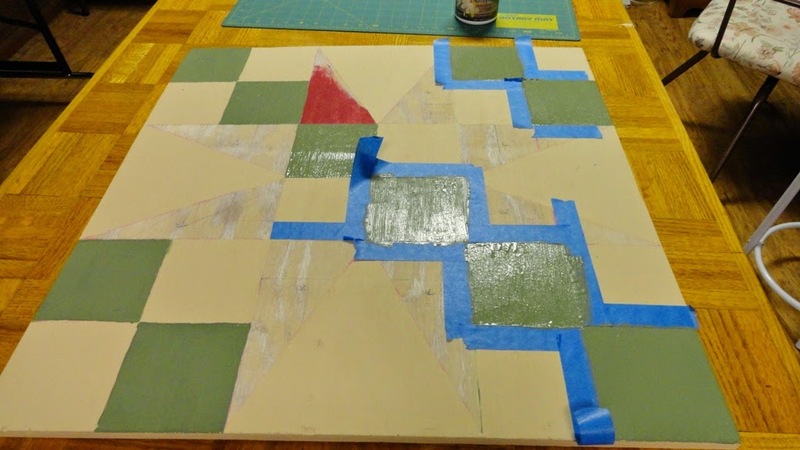 We had four workdays with three or four people working around my large dining room table, which had been covered with a gridded cardboard pattern board and self-healing mats. We used rotary cutters for straight lines; sharp scissors were essential for tight curves. Since none of us had done this before, we frequently consulted the directions to be sure we were proceeding correctly. 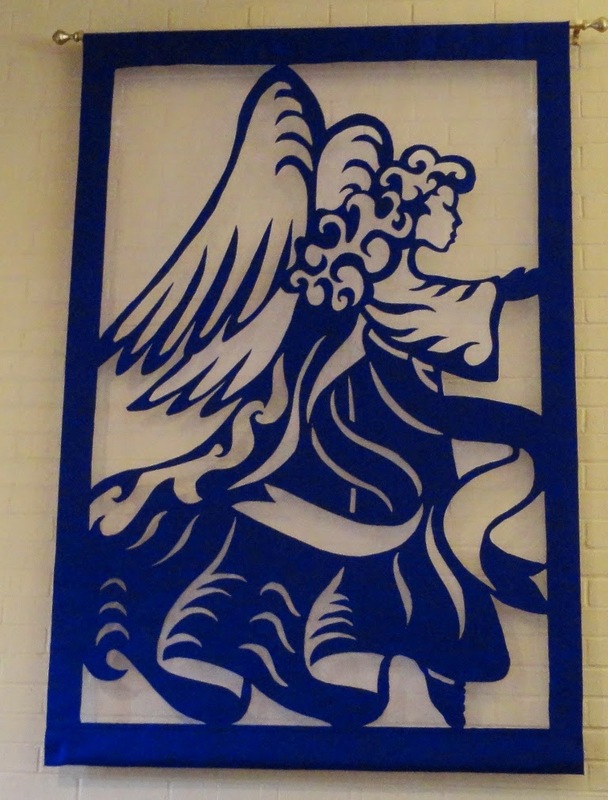 The patterns were for wall hangings 24" x 36" and we enlarged them to 48" x 72" for the outside ones (angel and kings) and 48" x 96" for the center ones (shepherds and family). After cutting the felt, netting was secured to the back with hot glue guns. 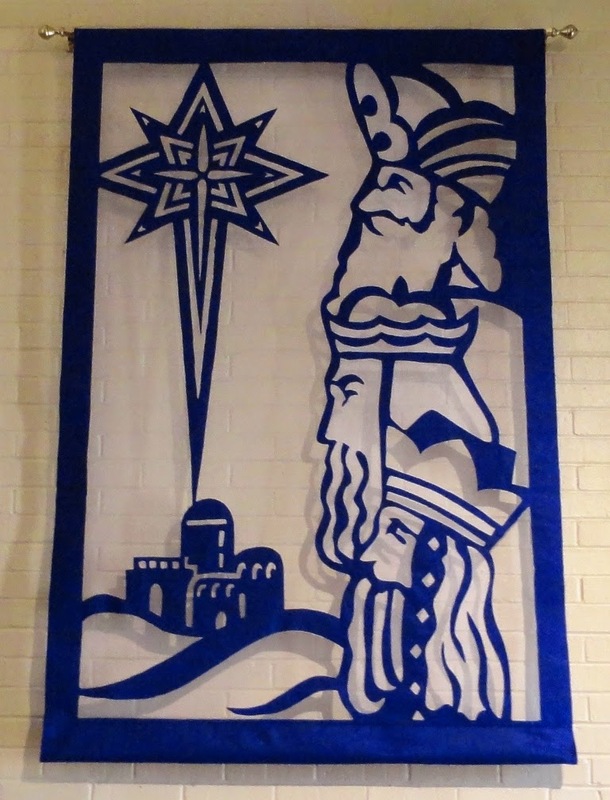 The netting is what holds the shape of the banner. 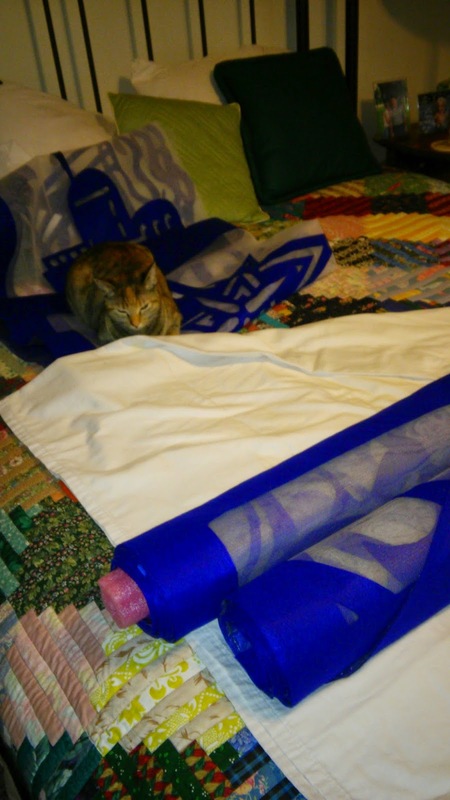 Between workdays it was necessary to keep the work area covered with a sheet to protect from kitty paws, but Rah-Rah managed to find a finished folded up banner for a brief nap. I love Thanksgiving! My heart is full thinking of the blessings in my life. Most years my family gathered at my brother's home in Austin, Texas, and we often drove through East Texas to pick up my parents in Lufkin for the trip. My sister's family also lived in Austin, so we got to be with both my siblings and their children. 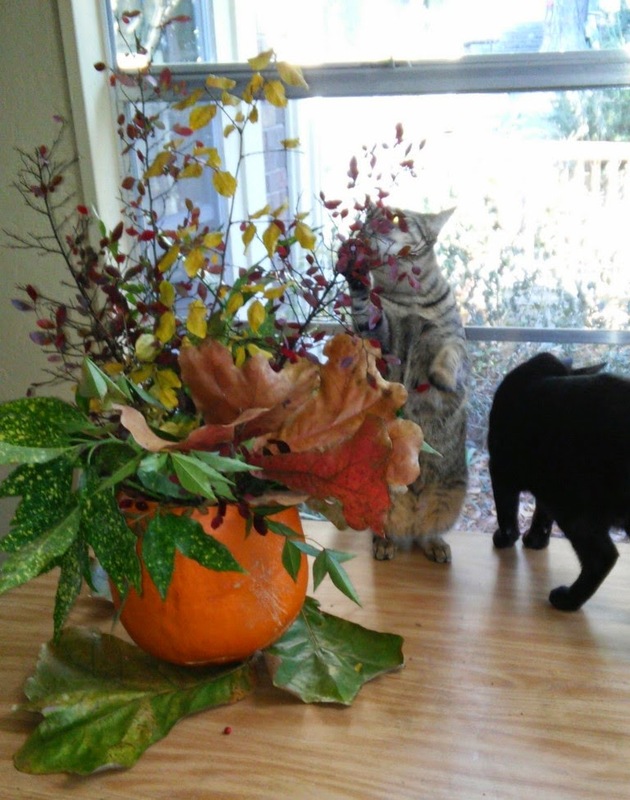 We nearly always decorated with leaves and branches we found outside. 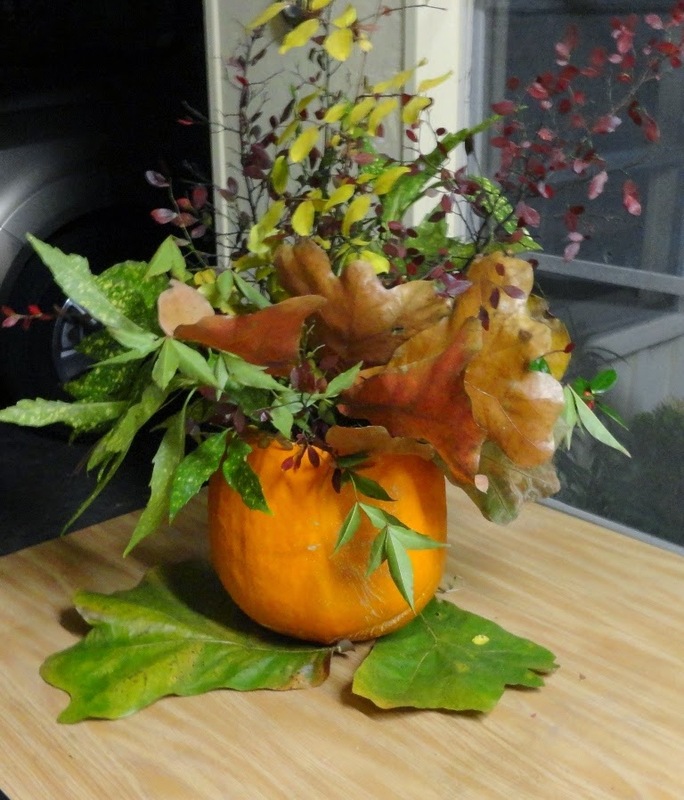 So this year, although the setting was different and there was not a crowd, the "homemade" centerpiece was a natural. This year there were only my daughter and me at my table. But who can keep from getting nostalgic over the memories! There was joy and celebration and thankfulness! It doesn't have to be a turkey/dressing meal to be a celebration. We prepared tacos and pinto beans--a feast with very little kitchen duty. She helped me with my cell phone and tablet. (Here's a piece of advice for my peers--buy the same kind as your younger family members so they can troubleshoot.) She was working on a research paper and I was repairing a quilt. Kittens were trying to help us both. 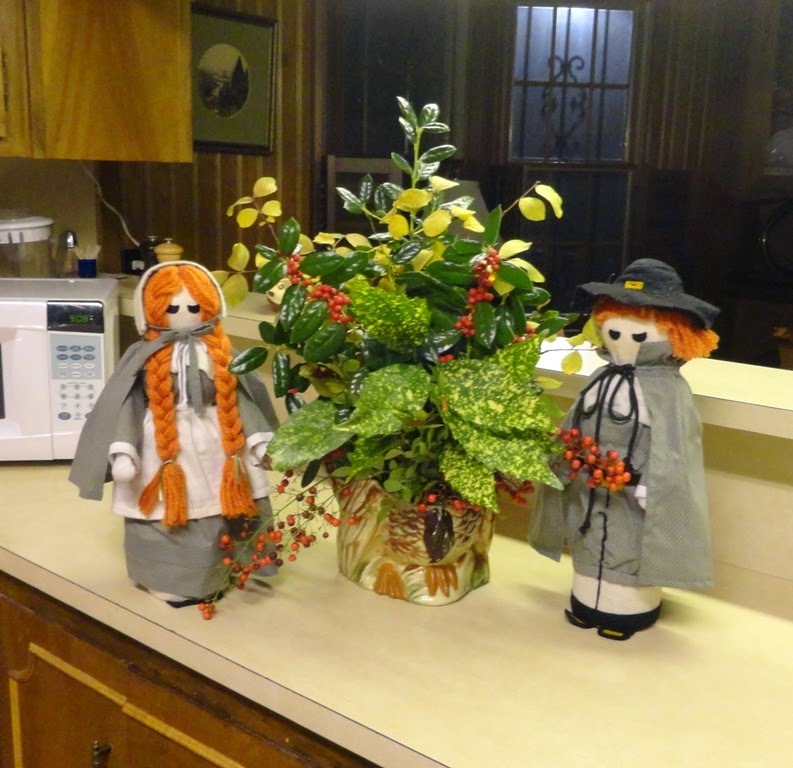 I made these little pilgrim dolls more than 45 years ago and they bring back memories of my grandchildren and my great nieces pictured with them. The container is a turkey cookie jar that might be valuable if it didn't have a patched crack in it. But it's been passed down from my husband's family, so its a treasured part of our decorations. 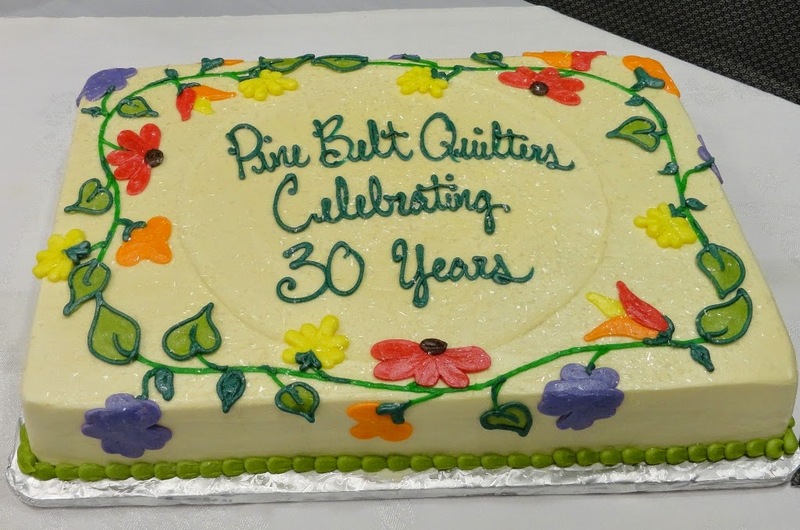 My guild, Pine Belt Quilters in Hattiesburg, Mississippi, recently celebrated its 30th Anniversary. 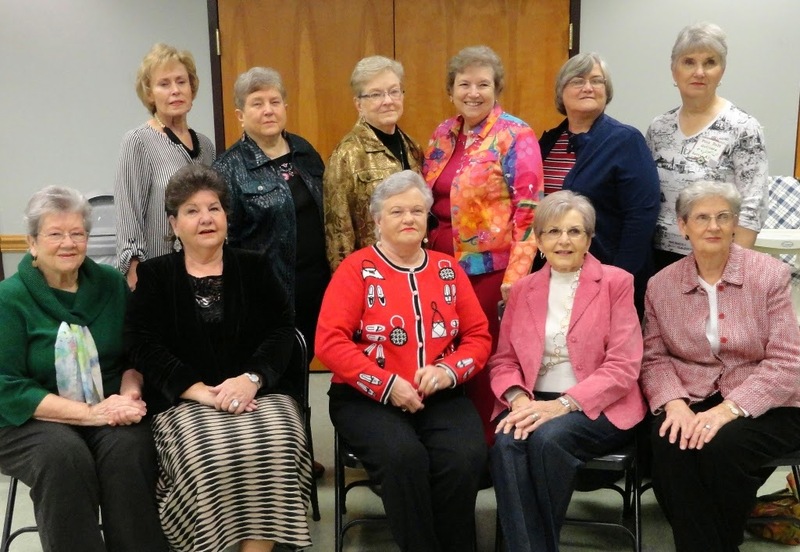 Who would have predicted back in 1984 that this group of 25 would grow to 160 quilters who have hosted 15 quilt shows and donated hundreds of quilts to hospitals and shelters for children and veterans? 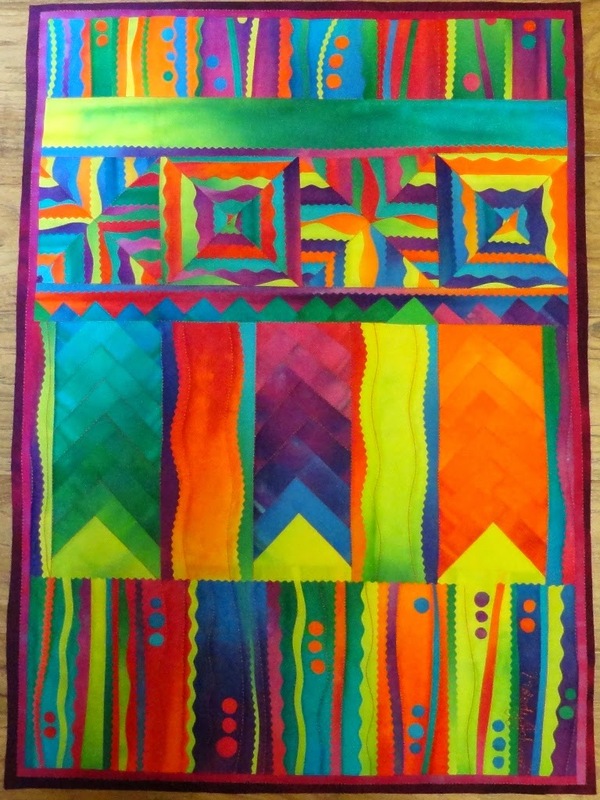 After PBQ was organized and active, we participated in organizing Mississippi Quilt Association in 1991, and I was honored to be its first president. Most of our friendships we develop over the years are through church affiliations, jobs, sports/hobbies like tennis, and passions/skillsets like quilting. How blessed I am to have quilters all over the state and US (and even in Canada!) because of our mutual love of designing, arranging bits of fabric, and stitching intricate thread play to express the artist in each of us. Doris Aultman and I were among the first officers and organizers, and are still active in the guild. Eleven of the 15 past presidents were at the meeting, pictured below. Mary Nell Magee was absent, and Susan Ryan Kelley, Judy Spiers, and Cheryl Owens have moved away. There are many exhibit opportunities in Hattiesburg, which makes artists very happy. 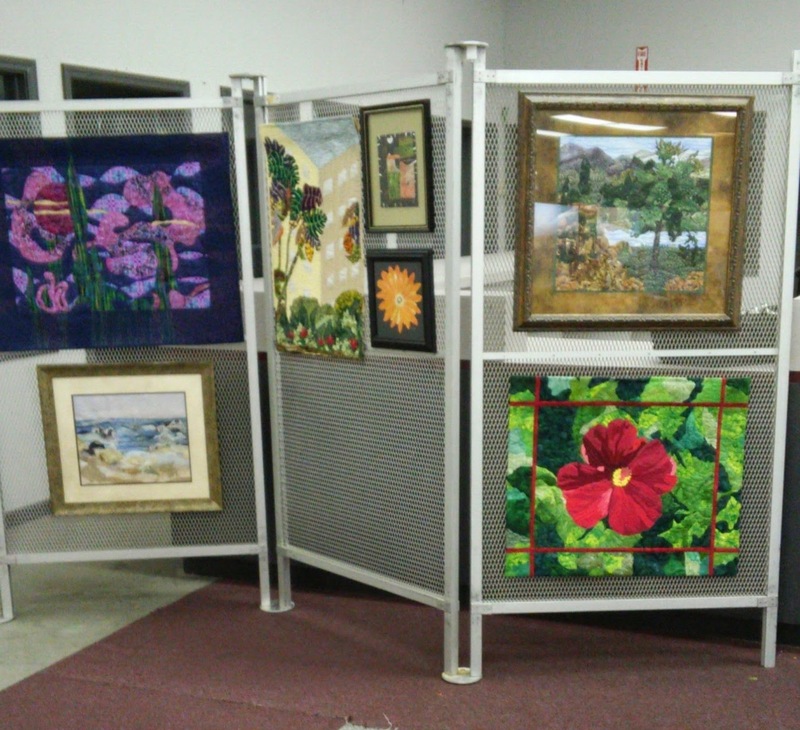 Our South Mississippi Art Association (SMAA) has a large booth at this HOLIDAY EXPO this weekend. The event is advertised as holiday shopping, kids' Christmas village, gifts, stocking stuffers, decorating ideas, Christmas party ideas, entertainment, fun, prizes, photos with Santa, food demos & more. It's at Midtown Market, next to Tabella's, Saturday and Sunday, 9:00-4:00; noon-5:00. 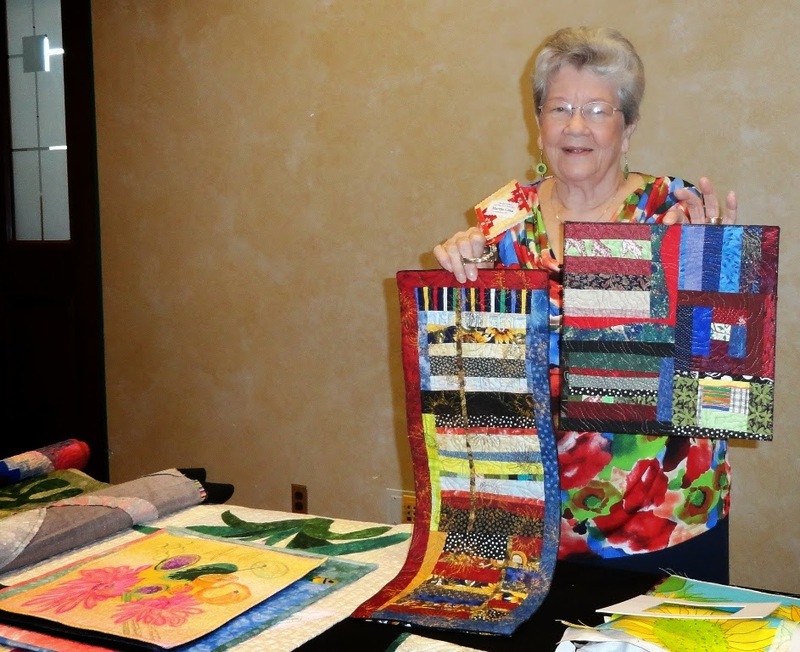 I participated in a marvelous community event last weekend--the Stone County Community Art Quilt Project, at the invitation of Betsy Rowell, Stone County Director of Economic Development. 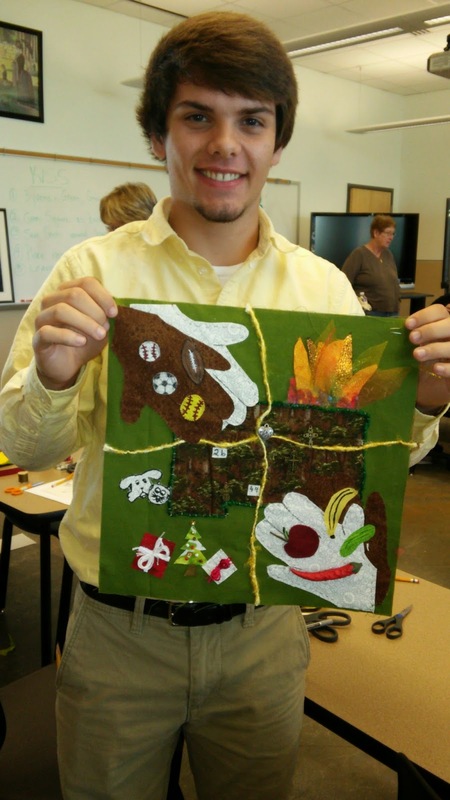 Kathryn Lewis of the Stone County Arts Council had gathered twelve teams composed of a community leader, a 9th grade Stone High student, and a quilter or artist to help interpret different assigned themes in a fabric square that would then be assembled into a quilt. We met at Mississippi Gulf Coast Community College on the Perkinston Campus and had plenty of art suplies to work with. Award winning fabric artist and storyteller Diane Williams from Jackson was there to share ideas on using textiles to tell the story. The teams had previously researched the history and culture of Stone County in their assigned theme topic, such as Spirituality, Patriotism, Health/Welfare, Higher Education, Natural Resources, City of Wiggins, and Stone County. My team was assigned Volunteerism, and my student, Hunter White, had drawn and cut out a very clever design featuring helping hands and some of the activities these hands participate in, such as food pantry, fire fighting, sports events, animal shelter, Christmas Child boxes, and church youth groups. These activities were laid out around a map of Stone County with the major highways (49 and 26) intersecting at Wiggins. 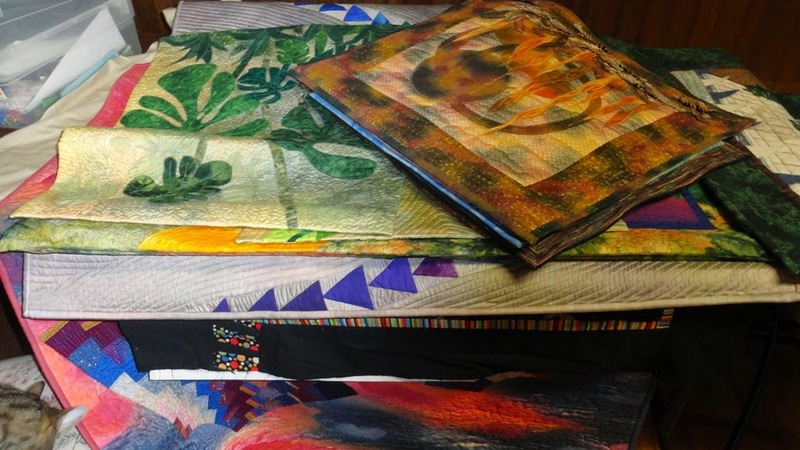 J. Marcus Weekley (also a quilter, writer and actor) will assemble the blocks and complete the quilt, which will then be dedicated to the "community and its people" and displayed at the Courthouse and other public venues. 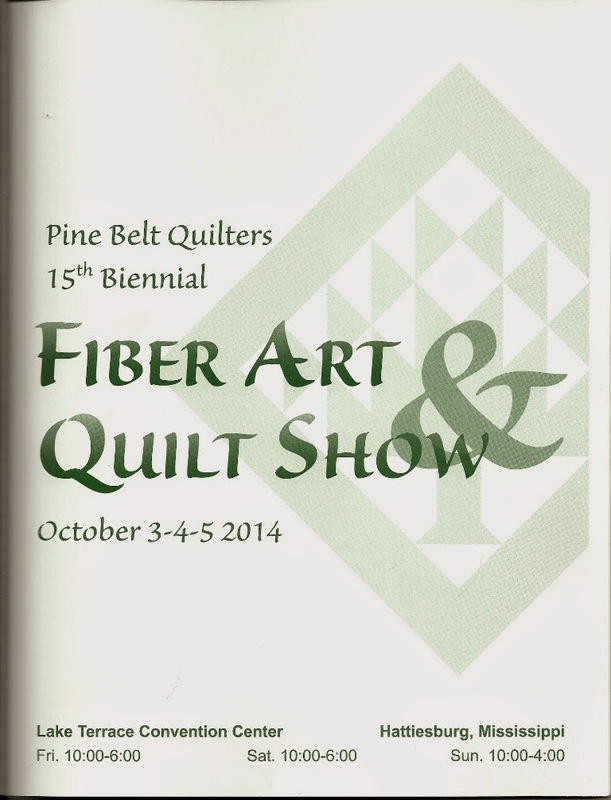 I had a special surprise a couple of weeks ago at the Mississippi Quilt Association Gathering in Vicksburg. Gatherings are always a good time to visit with friends we don't see often and to catch up on what we've been working on. I taught a Japanese Lanterns workshop several years ago, and Cindy Pannier brought her finished quilt to show me. Shelley Taylor and Cindy Melton have previously completed their quilts, and I was delighted to see another completion of this big project. 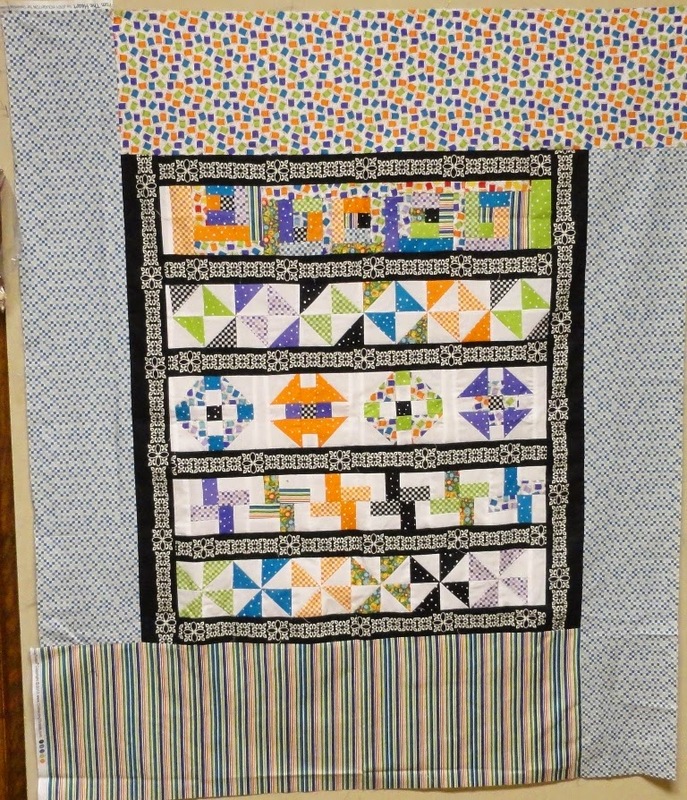 Not only had she finished her quilt, but she framed it with orphan blocks, adding more color and making good use of these other blocks. 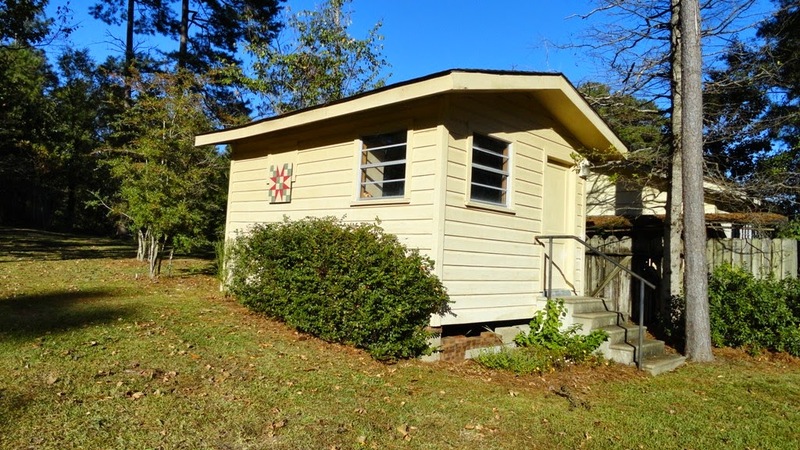 The pattern is Courthouse Steps, as old as the Log Cabin, but the arrangement of lights and darks creates a design that reminds one of Japanese Lanterns, hence the name. 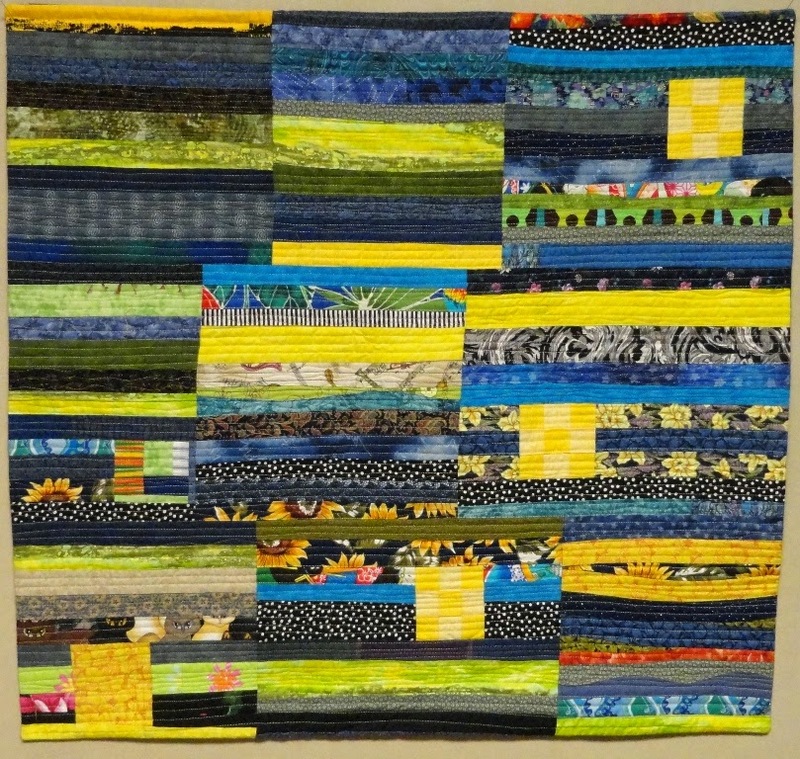 Each block is made up of four color sections, and the challenge is how to keep strips organized so that the adjoining block (on the row below, for instance) will have the right strips to finish the design. 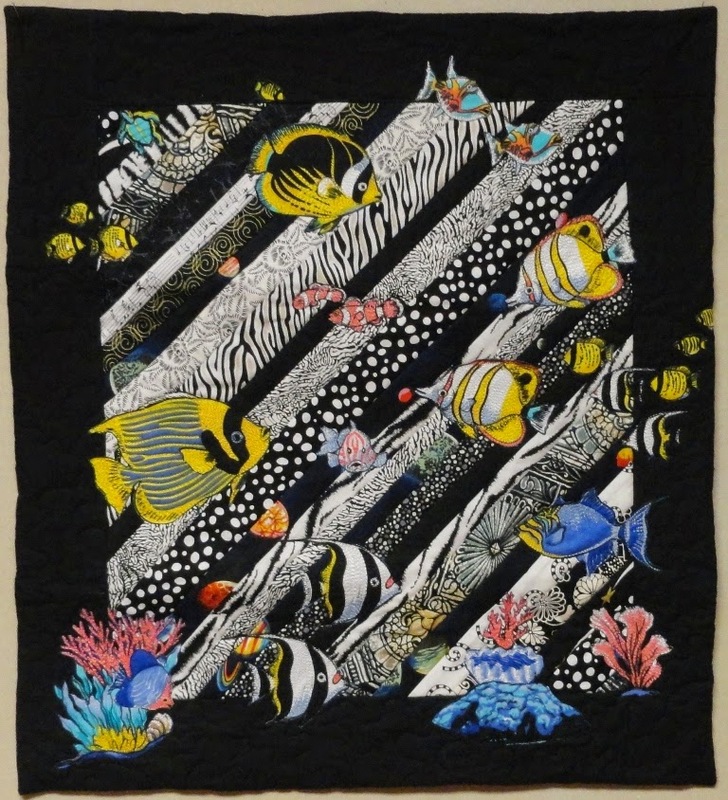 To better understand this, look at the upper right corner of Cindy's quilt (inside the black border). The block is made up of half the blue lantern, half the black lantern, half the purple lantern, half the olive green one. Blue strips from the block to the left had to be saved for this block, and olive green strips had to be saved for the block on the row below. 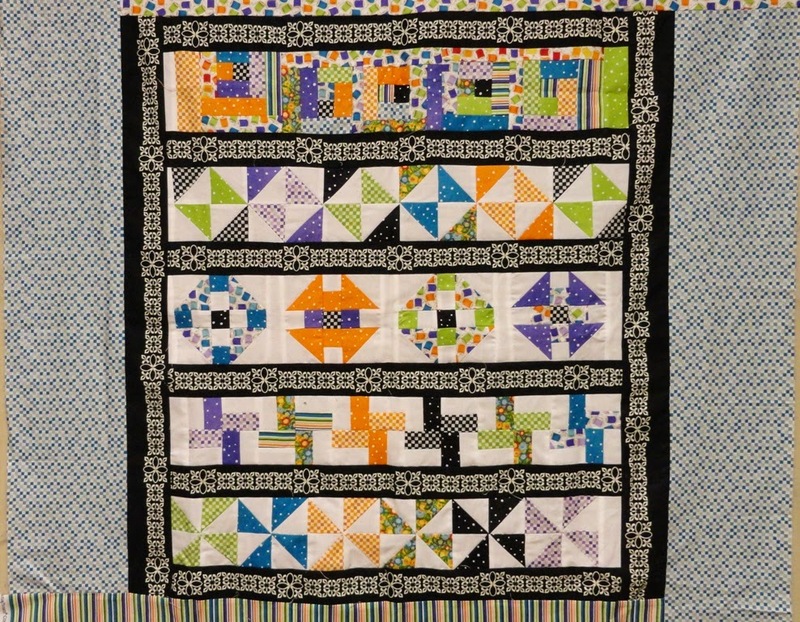 I'm especially proud when a class I taught helps a quilter finish a quilt, and Cindy's use of her leftover orphan blocks is brilliant! 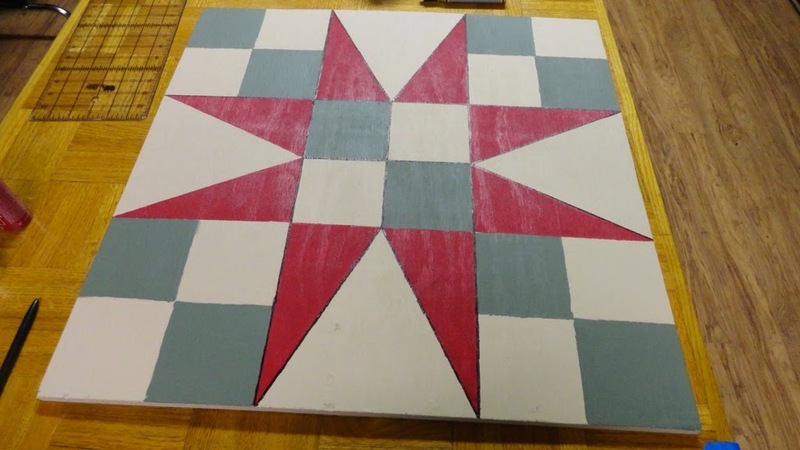 My Barn Quilt Sign is painted and has several coats of clear acrylic spray. I needed to do some trimming of the loropetalum bushes to open up the view by the little shop building where I wanted to install the sign. After this was done I asked a friend if he would come and help me put the sign up. His wife had made him one as a surprise and I knew he was pleased with it. Here is what it looks like on the side of my shop building. It is visible from the side street where my long driveway goes to the back of the house. 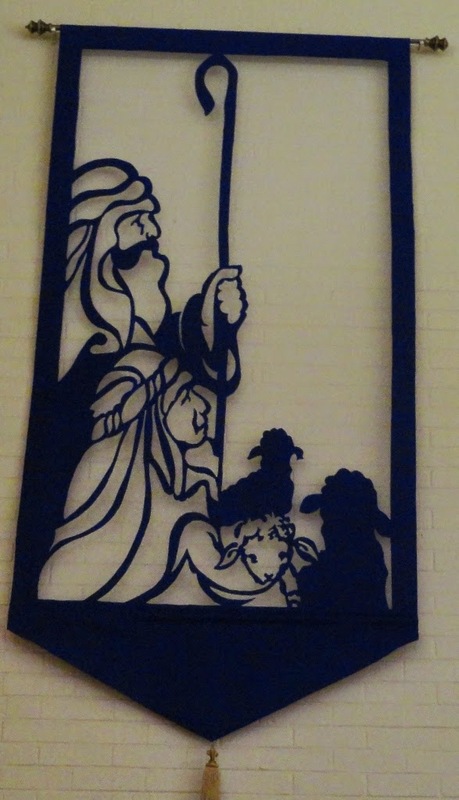 Meanwhile, in the house I've been working on some Advent banners for my church. 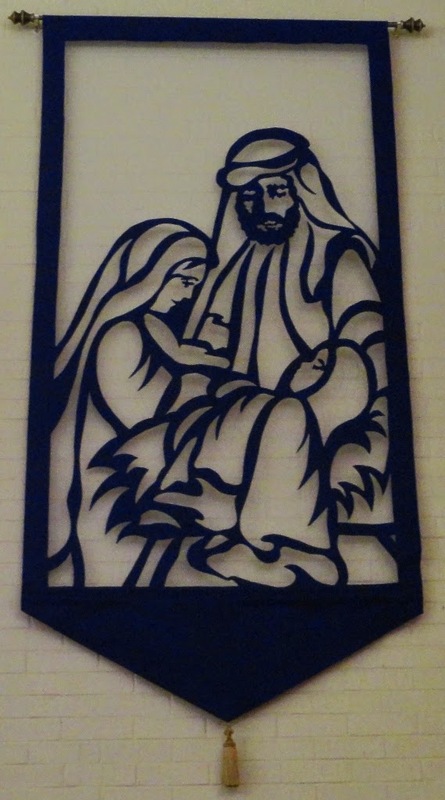 They are cut-away royal blue felt and are in four parts--The Angel, The Shepherds, The Family, and The Kings. Several people have been helping construct these. All are 48" wide; two are 72" long and two are 96" long. 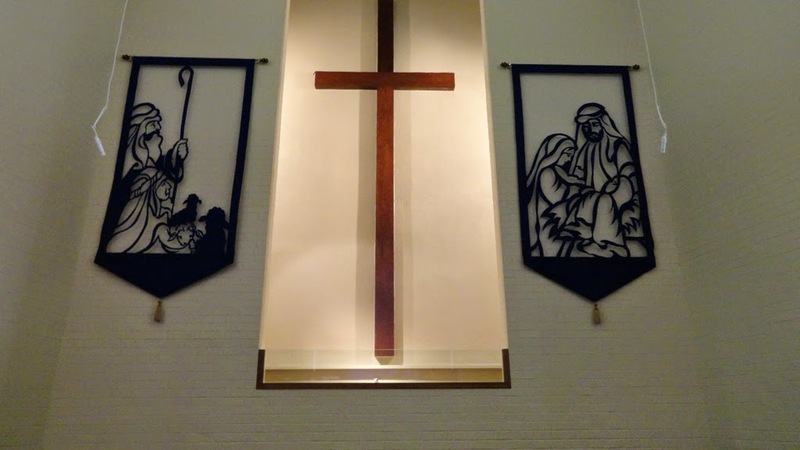 These will be hung for the November 30 service which begins the Advent season. 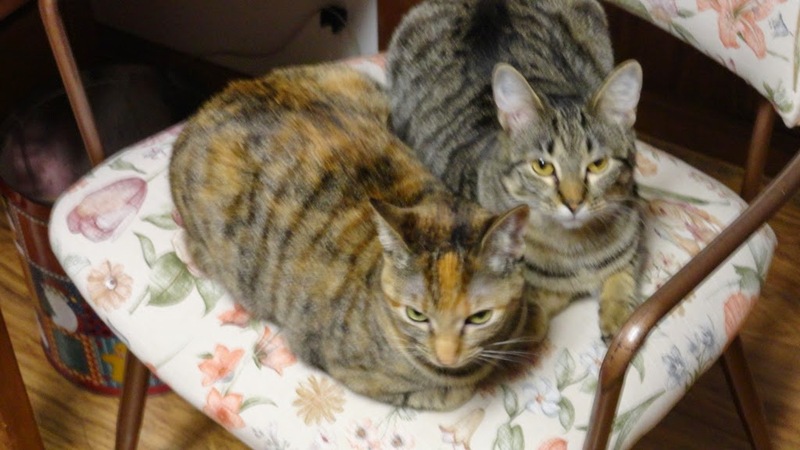 These occupied the dining room table for several weeks, with a sheet protecting from kitty paws. 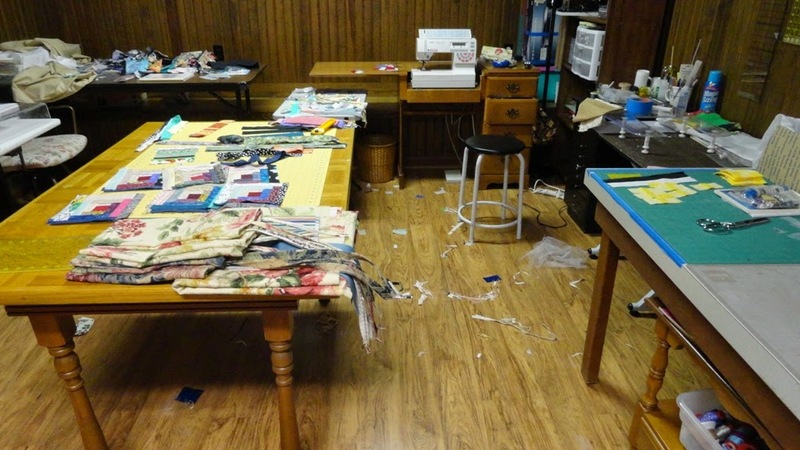 While I was painting the Barn Quilt sign and working on the Banners in the dining room, my sewing room stayed unusually neat. Now that these two projects are finished, it has taken on that familiar "well-used" look again. 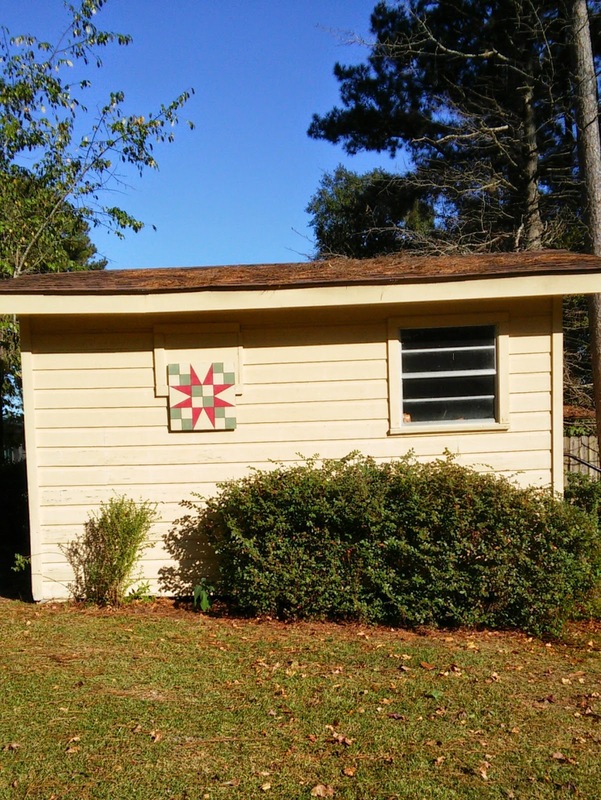 A Pine Belt Quilter member gave a program this spring on Barn Quilt signs she had seen on a trip and suggested that we might want to create some for our own quilt trail in our area. I have a small shop building in my back yard which can be seen from the street, so this seems a logical place for a barn quilt sign. Our signs are two feet square and I decided on the 54-40 or Fight block in three colors--cream, apple green, and red, with black lines and black outside edges. 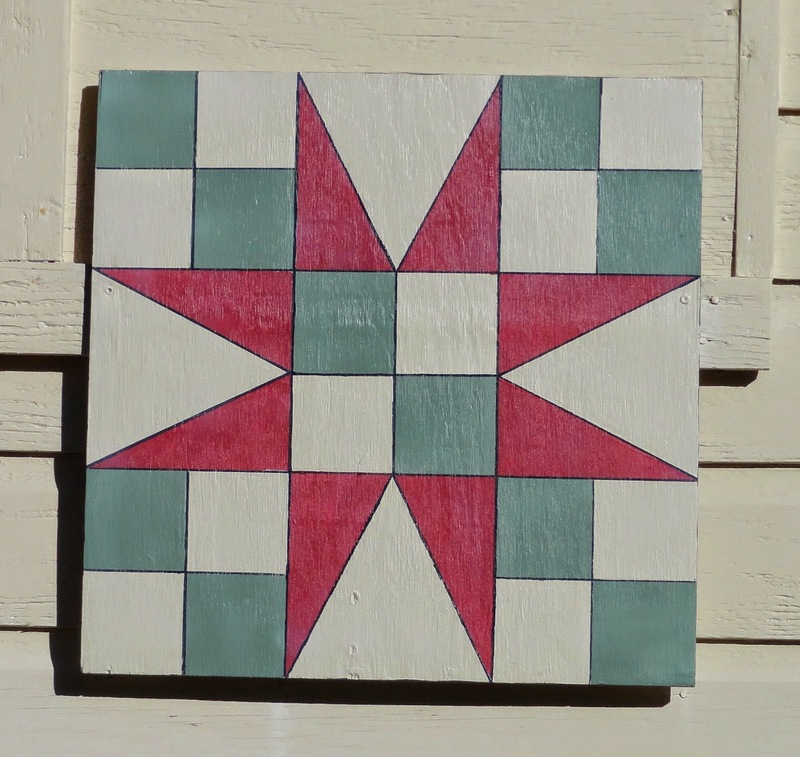 I marked my design on the treated wood board with a pencil and began painting with a sponge brush, first the cream background blocks, then the green ones, and finally the red triangles. 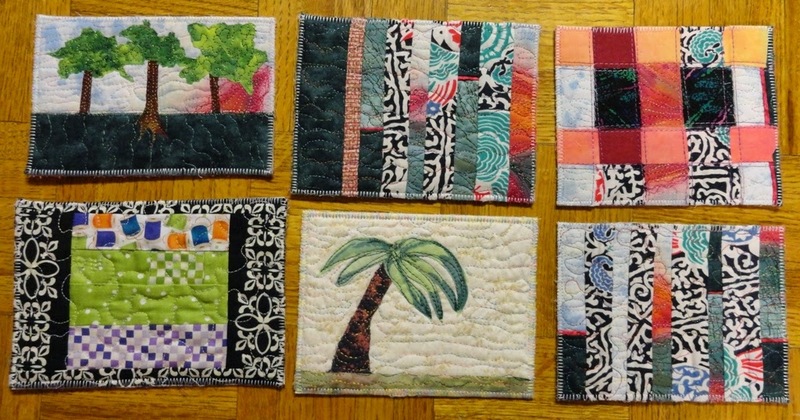 In putting stuff away after the quilt show I came across a Ziploc bag with some little 4-5" blocks and several pieces of fabric obviously left over from making these blocks. I imagine someone started this as a Children's Quilt and it came to me with some other donated fabric. The fabrics were bright and cheery and a little wild, not something I would have thought of combining, but I liked them. There were five partial rows, not all the same length, with some black/white strips that looked like they might be planned for sashing. So I could not resist finishing it. I added a white strip to the end of any row that was not quite long enough, sewed the black strips between the rows and on both sides and began to figure how to use the remaining fabric to make the quilt as large as possible. Here's the result. It measures 43" x 52". 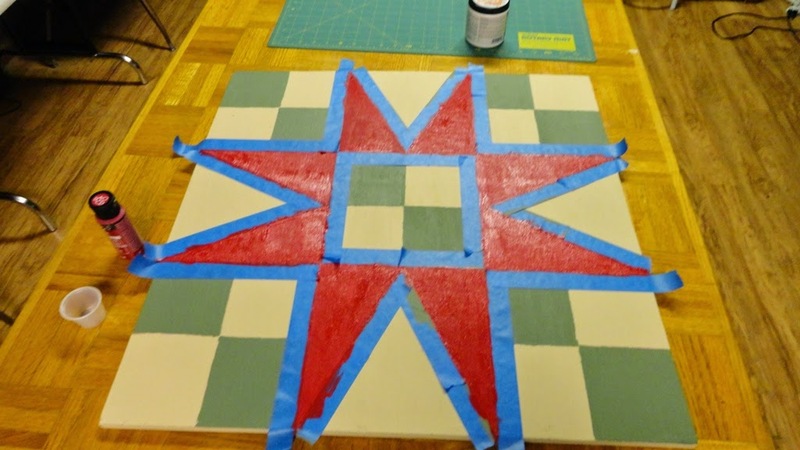 Next I cut apart a finished wall quilt that I had made using thickened dyes unsuccessfully. I cut it into 1" strips and sewed them back together with connecting strips and made several postcards. These were interesting, especially with the appearance of one of my favorite fabrics--a back/white Oriental-looking piece with unexpected bits of red, blue, and aqua showing up. This "favorite fab" is from a shirt I bought at a friend's garage sale a couple of years ago. It shows up quite often in my work and adds just the right bit of color to a mostly black/white piece. Thanks, Bill! Blocks on Parade, 17" x 23"
I have long been an admirer and blog reader of Melody Johnson's art work. She uses dramatic colors which fairly sing and vibrate. Recently when she posted a couple of pieces for sale I sent an email with my purchase request, hoping I would be early enough, since most of her pieces go fast. 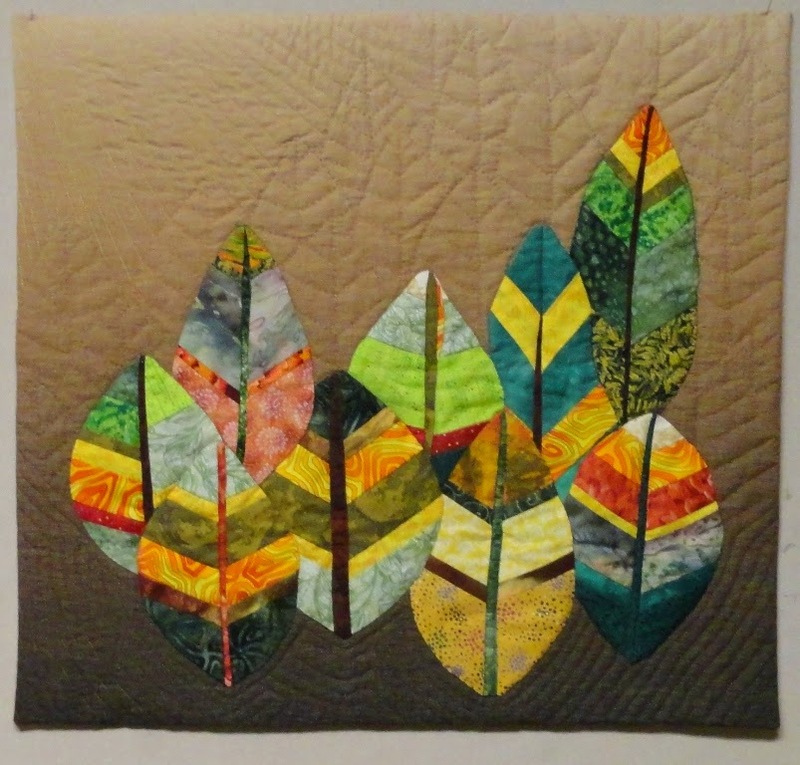 I was the lucky buyer, and the piece arrived just before our quilt show. I wanted to show it as the ultimate achievement during my Creativity lecture at the show. Now I will share it here; it's called Blocks on Parade. Melody is an avid gardener, knitter, decorator (furniture rearranger! ), and owner of two darling pugs. Her blog covers all the above. What she can grow in a backyard garden is amazing. I love having a piece of her art to hang in my home! 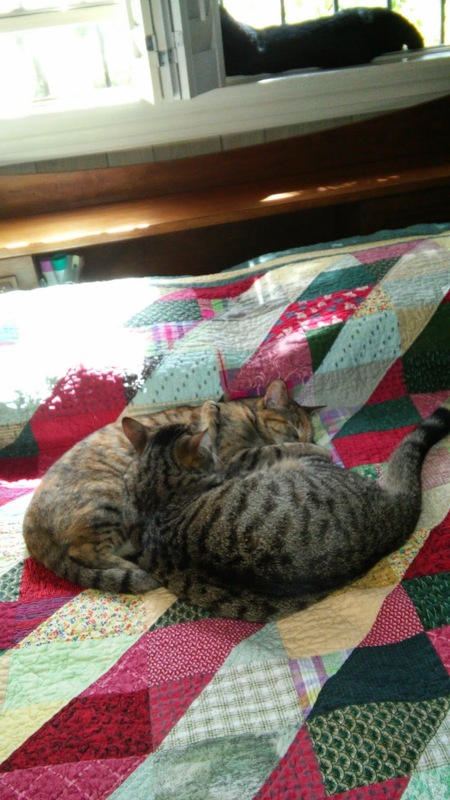 After Elizabeth's inadvertently getting shut up in the filing cabinet drawer for several hours, she spent most of the next day cuddling and sharing face baths with her sister, Rah-Rah. Tarbaby was unconcerned. Well, for starters, unload the car. Next, begin putting all those pieces I used at my lecture back in the closet or on their nails on the wall. I had a houseguest and after we enjoyed eating out all week, I was ready to cook a proper meal instead of refrigerator findings, so a grocery shopping trip was necessary (the cats did not eat out all week). Then there were some emails to catch up on and more pictures and the winners page to post on the guild's blog. Finally, I had a week's worth of checks and credit card charge slips to record. Pot plants needed some attention. 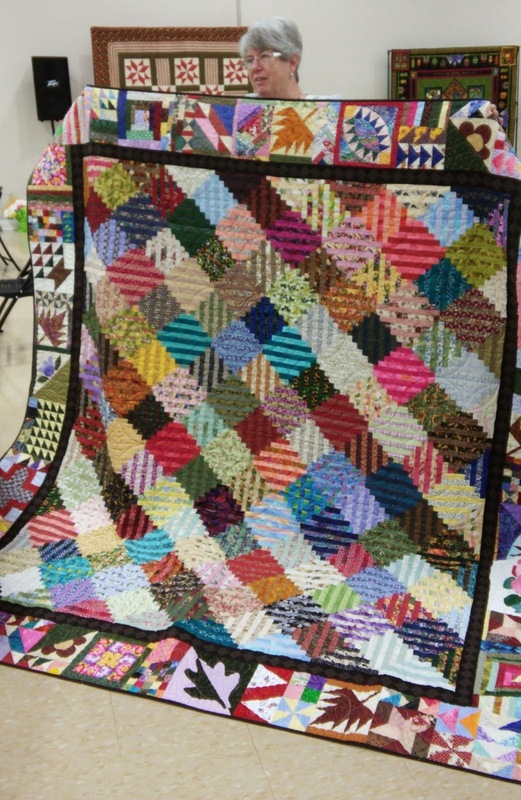 After seeing all the inspiring quilts at the show, several of us talked about how eager we were to get to our sewing machines! 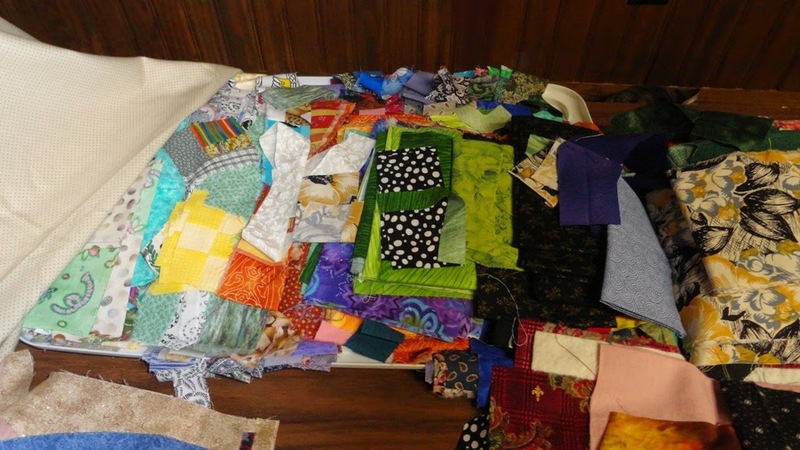 I keep lots of strips and squares cut and ready to sew. If I don't keep them covered, the cats bring several pieces to me during the night. Tomorrow, to the sewing machine! 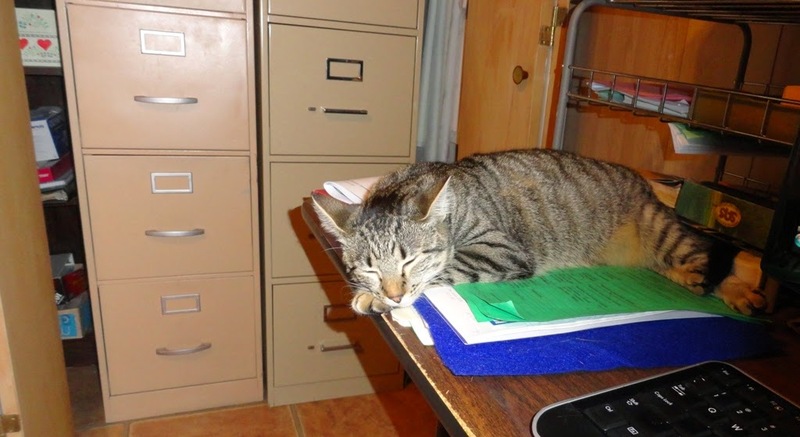 Elizabeth got closed up in one of these file drawers this afternoon and I hunted her for about seven hours, so she is sticking close to me. After all the receiving, judging, hanging, labeling, decorating, printing, and lots more . . . we had an entry hall full of people waiting to see our our show when the doors opened, in spite of a wet, humid high 80s morning. And they were not disappointed. 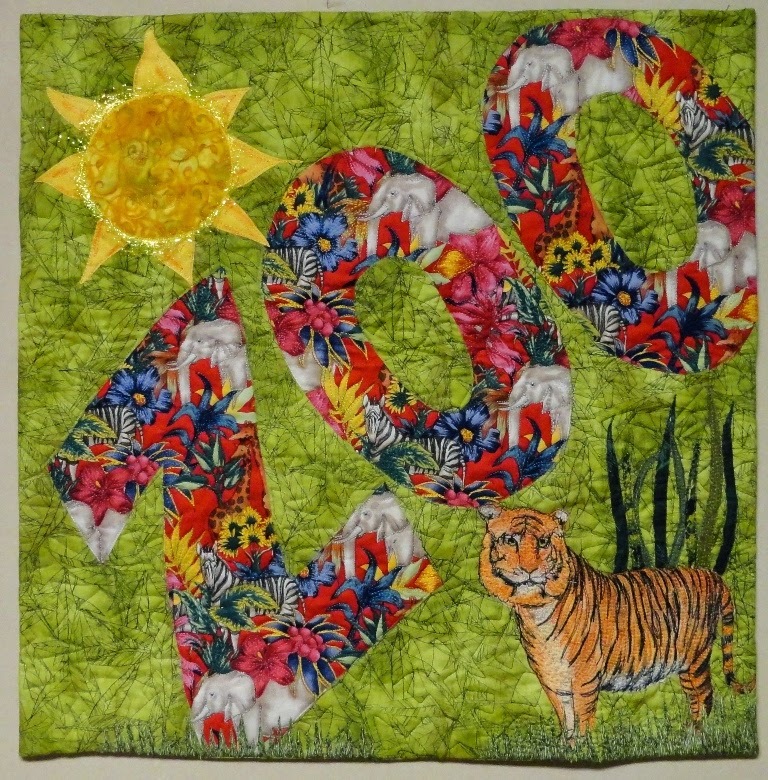 We have 340 quilts plus a Hoffman Challenge exhibit. 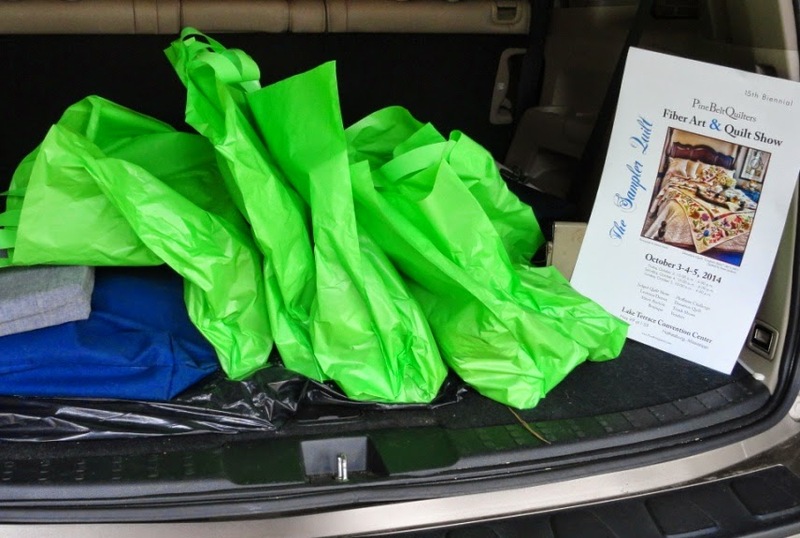 We have a silent auction, boutique, 20 vendors, hallway display of quilters' other activities, free lectures every hour, door prizes, even chairs placed about the exhibit hall to sit and rest your feet. It was rewarding to see ribbons on four of my five entries (pictures in yesterday's post). I presented a lecture on Creativity, where I enjoyed showing more of my work and discussing what inspires me. White glove duty is my favorite quilt show task, because it allows me to circulate and see friends and also answer questions asked. It is quite satisfying to help people understand techniques they see, as well as how the quilts are categorized. 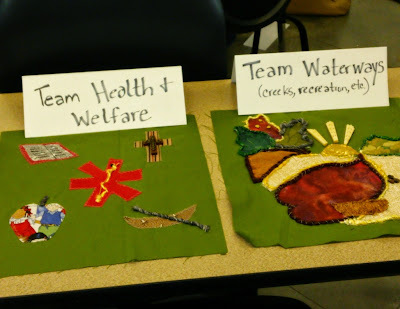 For instance, TA means Team Applique; THMS means Theme Small; ART means Art (easy one); then there's ME/S/WC/O, which means Machine Embroidery, Stitchery, Whole Cloth, Other (needs explaining). A day at the show leaves my feet and knees screaming, but after a meal and visit at Patio 44 with friends, I still was able to catch part of Back Door Coffee House at University Baptist Church to hear Oh Jeremiah (local singer) and Laura Dragon (author of Hurricane Boy). All in all a most enjoyable day! And there are two more, especially nice because of a cool front with 59 degrees and bright sunshine. 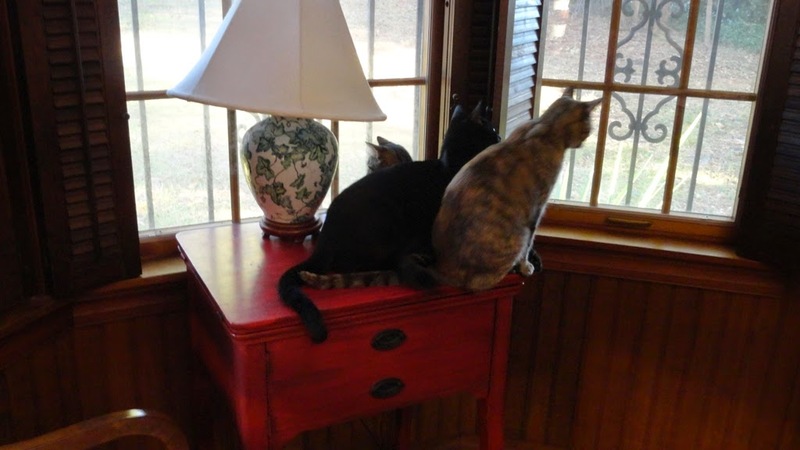 The cats are not pleased; in fact, I hear "Oh, rats . . . she's leaving us all day again!" 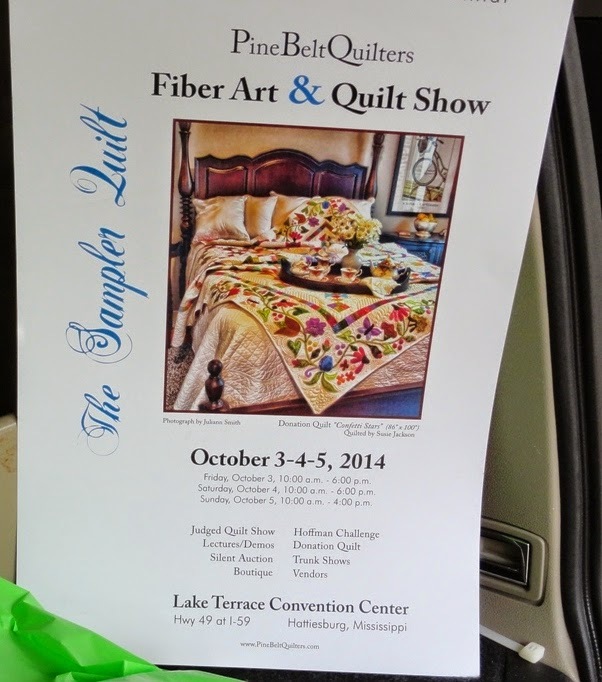 Our guild's show, Pine Belt Quilters 15th Biennial Fiber Art & Quilt Show, opens tomorrow in Hattiesburg, MS. Lake Terrace Convention Center's exhibit hall is filled with 340 judged quilts plus a Hoffman Challenge trunk show. Linda Flanders prepares an 8-1/2" x 11" first-class show catalog which contains descriptions of all the entries plus sponsors, vendors, some guild history, and map of the show. My responsibilities have been helping to proof this catalog and to solicit sponsors and ads. My last task has been to prepare the winners pages, which can't be done until the judging is completed and all awards selected. Keeping tabs on all the numbers, quilt names, makers' names, and awards is a daunting task, but lots of checking and cross-checking gets it as accurate as possible. I have five entries in the show. Here they are. The show opens tomorrow and runs for three days.